Apparently those who speak Chinese are well represented on Twitter! A currently trending topic on Twitter is #GoogleCN. 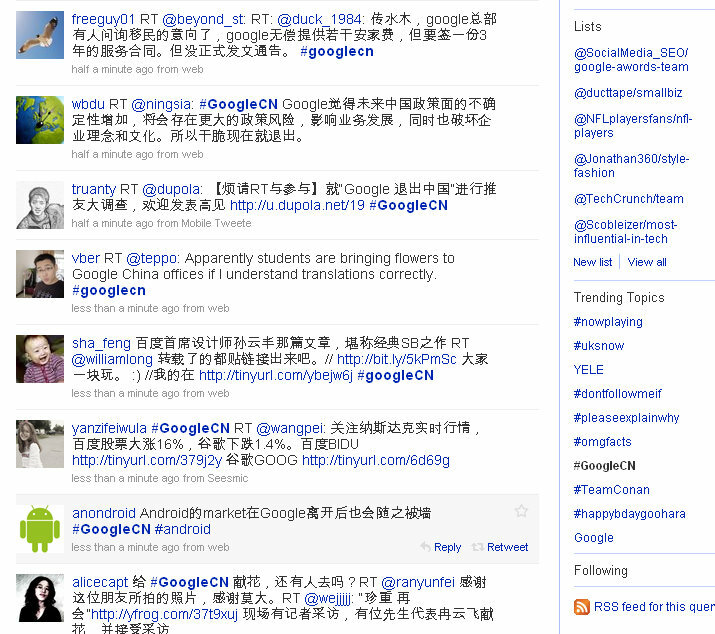 This represents Google China, the search engine’s translation for Chinese speaking users. Check out Google Chine here. The word on Twitter is that Google is contemplating existing the Chinese market due to recent attacks on the Gmail platform. Also, Google faces a lot of uphill battles in China regarding “open content sharing”, “data indexing and archiving”, and slew of other political issues. One person on Twitter said that according to what he understand of the Chinese language, people are tweeting that flowers are right now being brought to Google’s headquarters in Chine. It’s an interesting story, and we’ll see what happens throughout the day.